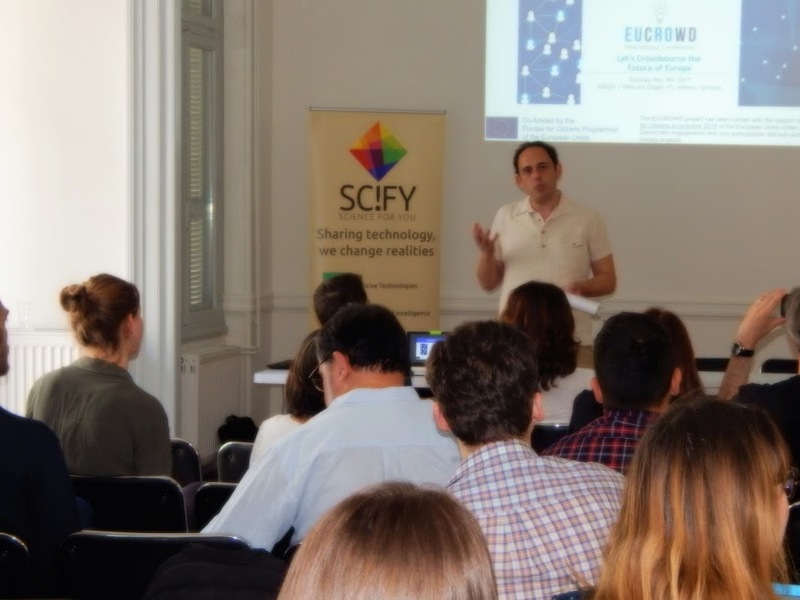 The fourth EUCROWD public event took place in Athens on 9th May 2017. The international conference and workshop “Let’s Crowdsource the Future of Europe” organized by Science For You brought together 47 citizens from 9 different countries. The event focused on how EU decisions are made and in what ways crowdsourcing will allow citizens to participate directly. In particular, participants discussed when crowdsourcing could be used in the legislative process of the EU, what topics should it cover and what tools and methodologies can enhance crowdsourcing by learning from best practices in Greece. The aim of the conference is to share and discuss experiences and visions of citizens participation in public decisions from the view of confidence, efficiency, transparency and legitimacy. French cases of using collective intelligence digital platforms within the civil society for decisions involving the general interest will be presented. Facilitated workshop will invite participants to work on the proposed general issue of participation to the democratic daily processes by distant audiences, either from the “res publica” or the digital life. Special guests, like associations used to work with disadvantaged and “disconnected” people, will participate to these workshops to enlighten the discussions.